There are so many successful sub-variants of the C-130, it is hard to say which one is the most successful. One sub-variant that definitely has been up there on the success scale is the AC-130 Spectre ground attack version. This aircraft has the distinction of carrying the world's largest airborne gun, a 105mm Howitzer cannon. With all the side firing weapons on the AC-130, an orbiting Spectre can bring a massive amount of firepower to bear on a ground target. 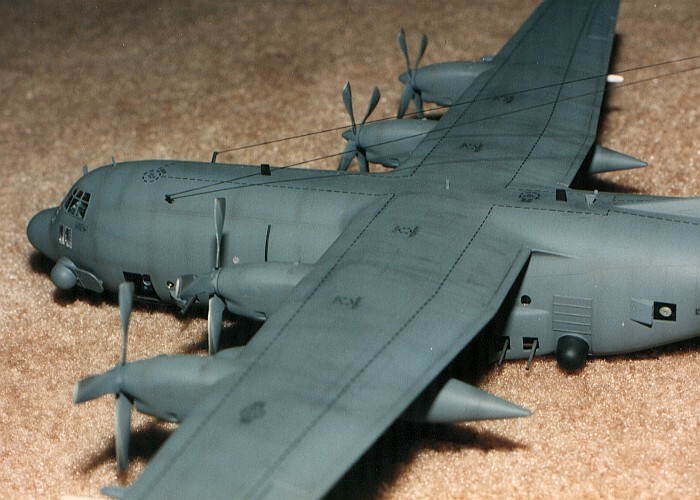 The Testor (Italeri) model is an AC-130A, complete with the correct three bladed propellers. While good for the modeler wanting to build an early version of the Spectre, it did not help me since I wanted to build a later version. 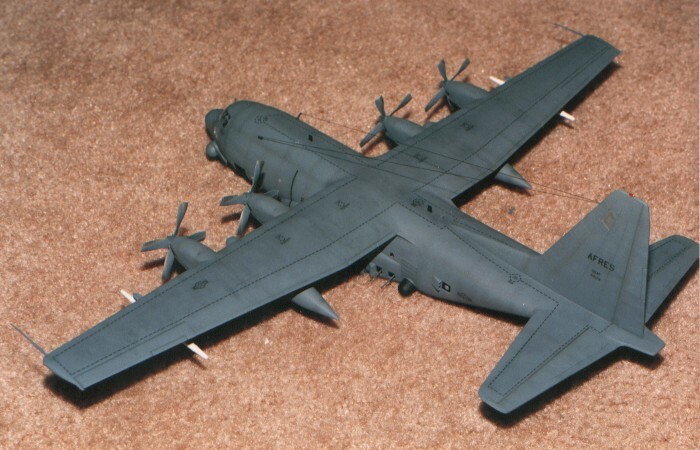 When I built this model, I was also building a DC-130A. Testor (Italeri) provides the four bladed propellers in the DC-130A. 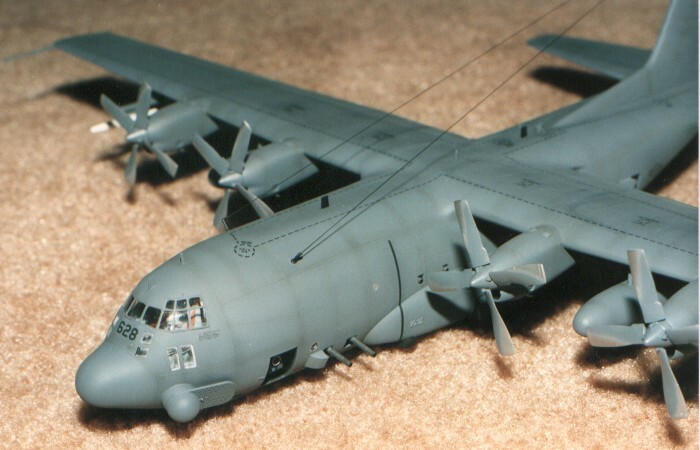 Since the DC-130 kit really needed the three bladed propellers, it was a simple matter to swap the engine nacelles and propellers between the kits. 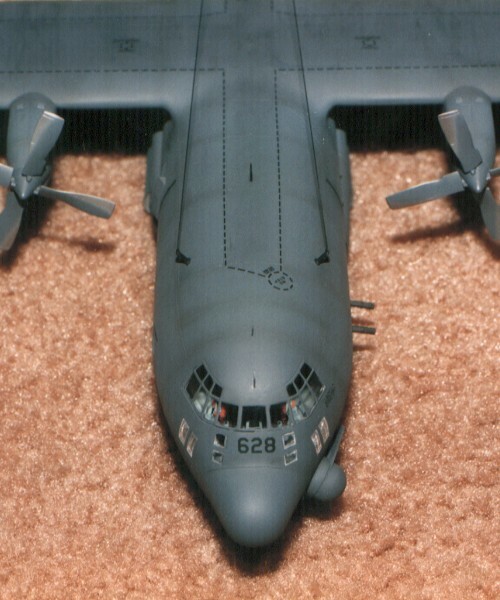 The result of the new engines and propellers in the AC-130 kit was that I now had a kit of an early AC-130E. 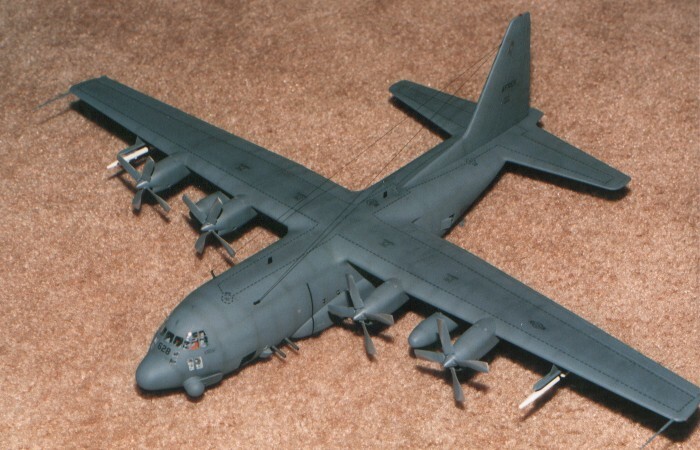 Very early on, the AC-130E's all had the 105mm Howitzer installed, but the Testor (Italeri) kit does not provide this. It was close enough, having a pair of 40mm Bofors cannons in the rear fuselage. I otherwise kept it simple and mostly out-of-the-box, doing only the following things to the stock kit. 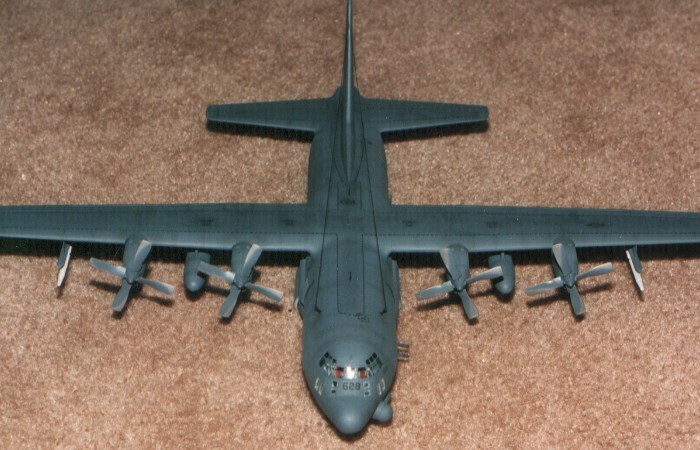 I swapped the engine nacelles and propellers from a Testors (Italeri) DC-130A kit to get the desired four-blade style of propellers for the aircraft. I added the line antennas stretching from the fuselage to the tail top. I used all Model Master enamel paints. The kit provided no real issues to overcome and the one-color camouflage made painting the model a quick process. The markings (the few that existed) are taken from the kit decal sheet. For the wing-walk markings, I created a mask using a file card and tape. Then I painted the wing-walk markings as it was going to take "forever" using decal striping. For weathering, I used my typical style of thinned down enamel paint washes and air brush shading. I finished the weathering with some dry brushing to pop out the surface details. For a more complete discussion of what I do to weather my models, see my posting on "Weathering Aircraft".